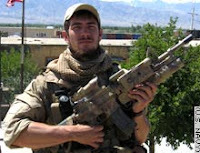 Danny Dietz, pictured here, was killed while conducting counter-terrorism operations in Kunar Province, Afghanistan. Coalition forces located the sailor while conducting a combat search and rescue operation July 4, 2005 in Kunar Province. He was awarded the Navy Cross for his actions in battle, and his hometown of Littleton, CO is planning a memorial in his honor. Some parents in the community are opposed to the memorial. They say the statue, depicting Dietz clutching an automatic rifle, glorifies violence. In Berry Park, it would be within blocks of three schools and two playgrounds. "I don't think young children should be exposed to that in that way - unsupervised by their parents or any adults," said Emily Cassidy, one of the mothers. People in this country have lost. their. minds. Danny Dietz is a hero, and his life should be memorialized. Every child in Littleton, CO should be taken to that statue and told about the war, why we fight, and how he died to protect their freedoms. I bet these same people are all for teenage girls getting abortions without notifying their parents, but good Lord, don't let them see an image depicting someone holding a weapon that has a positive connotation to it. The fact that they can compare a statue of a fallen military hero to the shootings at Columbine absolutely escapes me. How can you draw any kind of parallels between idiots rampaging through a school, indiscriminately killing innocent civilians with someone who has taken up arms in defense of his country? I try to stay open minded about some things, examining both sides of an issue. But in this case, there is no way I can wrap my mind around what these people think. I think it's probably worth keeping in perspective that the number of people opposed to the memorial is probably tiny. Media are attracted to conflict, and there is a journalistic convetion that you give equal weight to both sides of every issue. I'm guessing Ms. Cassidy represents a group of concerned parents that would fit comfortably into a minivan, hardly worth generalizing about whether people in this country have lost their minds or not. It's people like Emily Cassidy that make Colorado look stupid and ruin it for the natives. What do you want to bet that she moved there from someplace like California? But that aside, God Bless, Danny. You did good, son. Community symbols have a larger value than the monument itself. Threats to the monument must be taken seriously and should not be underestimated. Supporters of Dietz' legacy and, more generally, civil-military relations in Littleton, CO need to be mindful of the San Francisco debacle with JROTC and the USS Iowa. It's important that the Dietz memorial succeeds.